Aadi Perukku, also known as Pathinettam Perukku, is a very significant festival observed during the Tamil month of Aadi (mid-July to mid-August). Aadi denotes the Tamil month, and Perukku means to multiply/increase. It is also called as Pathinettam Perukku as it is celebrated on the 18th day of the Aadi month. ‘Pathinettu’ in Tamil means 18. Aadi is the month of committed observances of religious practices especially for Goddess Shakti (Mother Nature), related to water forces and natural forces. Prayers and Poojas are offered to propitiate the powerful goddesses and seek their protection from the inauspicious aspects that are often associated with the month. As the water level starts to rise during this month, it provides an opportunity for sowing and planting. 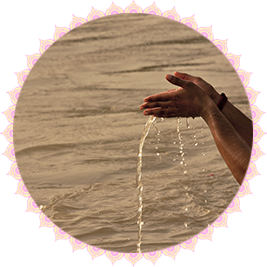 This festival is celebrated to pay respect and gratitude to Mother Nature, rivers, and other water bodies. This festival is observed with reverence on the banks of river Cauvery and other major rivers of Tamil Nadu. Womenfolk perform Aadi Perukku Pooja on the banks of the river. They take a holy dip in the river and wear new clothes. Aadi Perukku Pooja involves water rituals that include letting special lamps float on the river. Women also perform sacred Sumangali Pooja (‘Sumangali’ means a married woman who lives with her husband) and offer new ‘Mangal Sutras’ (sacred marital thread) to other married women. Since the festival has deep connections towards prosperity, many people worship various Gods and deities. People also perform Poojas and homas (fire prayers) for Goddess Lakshmi, as the occasion symbolizes fertility and prosperity. Another important ritual of this day at the villages is the ritual of sprouting or germination of the nine grains or the ‘navadhanyam’ in a mud pot. This is called as Mulaipari and is a very important ritual, which is celebrated reverently almost in every village. Ladies in the villages carry earthen pots with grown grains on their heads and walk in a procession towards the river where the grains are dissolved towards the end of the celebrations. The village goddess is beautifully decorated, and she is also taken in the procession. The significance of performing this ritual is that by performing this ritual and offering prayers, the Goddess for rain and fertility of land shall bless the people and the village for a rich harvest.